By combining two complementary methods of estimating appearance from skeletal evidence — DNA phenotyping and forensic facial reconstruction — the Snapshot Facial Reconstruction Service produces the most fully informed recreations of antemortem appearance ever produced from skeletal remains. 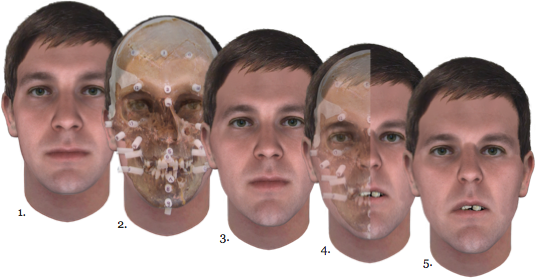 Stages of a Snapshot Facial Reconstruction: (1) a Snapshot composite produced from DNA extracted from the subject’s bone; (2) Snapshot composite with skull overlay; (3) Snapshot composite after rescaling to conform to skull dimensions; (4) a cutaway image illustrating near final composite; and (5) final, blended Snapshot composite. Snapshot phenotyping algorithms are used to predict a decedent’s appearance and ancestry using DNA extracted from bone. Independently, a traditional facial reconstruction is performed by a forensic artist who has been specifically trained to interpret Snapshot DNA Phenotyping results. Tissue depth markers are physically applied to the decedent’s skull, based on DNA-determined ancestry and estimated body weight, to produce a prediction of face shape from cranial morphology. A final composite is then produced by digitally blending the two predictions. 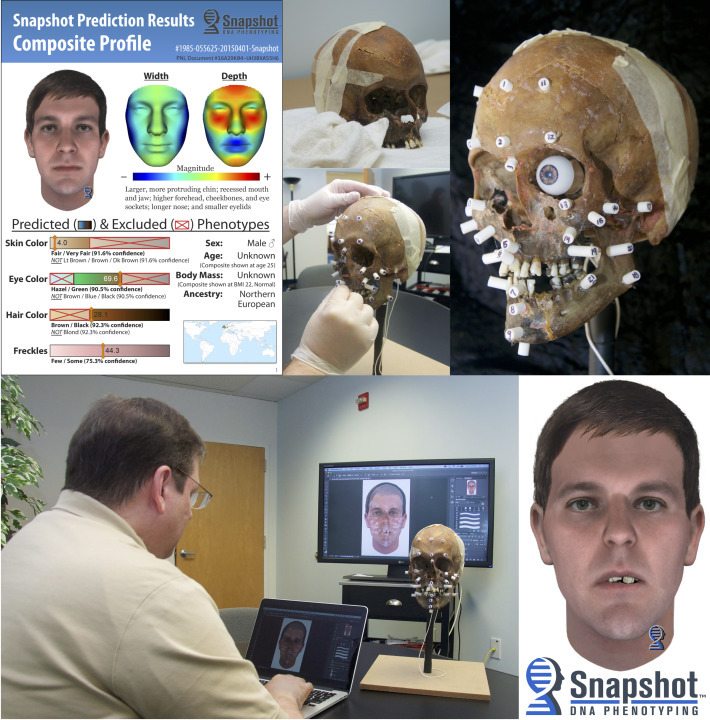 Thom Shaw, an IAI-certified forensic artist at Parabon NanoLabs, performing a physical facial reconstruction and the digital adaptation of a Snapshot composite to reflect details gleaned from the victim’s facial morphology. Traditional forensic facial reconstruction often lacks ancestry and pigmentation information about a dependent, which is why they are often depicted in grayscale. In cases of prolonged decomposition, scavengers may remove the mandible (jawbone) from a skull. Snapshot DNA Phenotyping can provide a forensic artist with a solid prediction of jaw shape to assist with the reconstruction process. DNA phenotyping models are tuned to explain only normal variation in appearance, whereas skull evidence may reveal distinguishing facial features that may be difficult to predict from DNA alone. 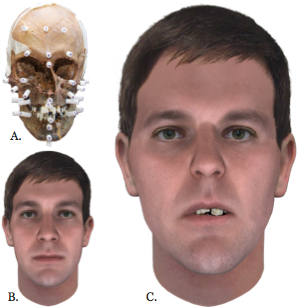 When the evidence for a case includes the victim’s skull (A), it may be possible to perform forensic facial reconstruction to further enhance the Snapshot prediction (B), resulting in the final blended Snapshot composite (C).